I started with an 8x10 canvas board, using a piece of plastic netting from an onion bag I sprayed some of Tim Holtz spray stain through the netting. Put strips of washi tape across the back. The steam punk paper I layered on a piece of random lettered paper, then I used a piece of string mesh paper with the frayed edges under that. I added the small orange raven staring into the face of the girl, the black raven coming off the page, and the word nevermore was done with Tim Holtz letter tiles, an honor to my love for Edgar Allan Poe. The wooden butterfly added nice depth. I put the brass gears and clock up the side, colored a flower for the bottom gear, and used a metal flower in the second one up. I am not usually a fan of using humans in my art, but I absolutely love how this turned out! Might just have to keep it for myself. Your canvas is perfect for our challenge! Love the steampunk style and all the embellishments you've added! 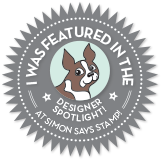 Thanks for joining us this week on Simon says Stamp Monday Challenge Blog! Barbara! Wonderful canvas, Krista!!!! Love the little orange bird looking at her.